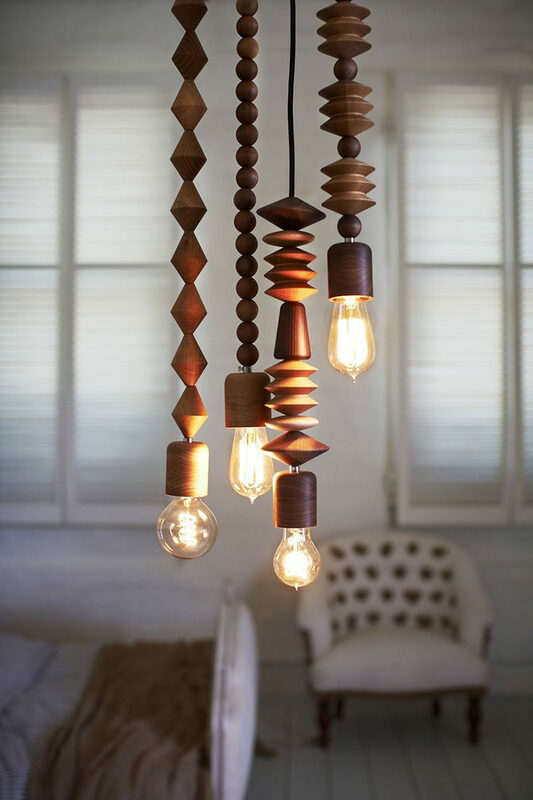 Wood pendant lights are a great way to bring in a touch of nature and add style to your home. They come in all shapes, sizes, and finishes so whether you want a super contemporary look or a slightly more rustic one, wood pendant lamps can fit into any interior. Here are 15 examples to give you an idea of their versatility and unique look. 1. 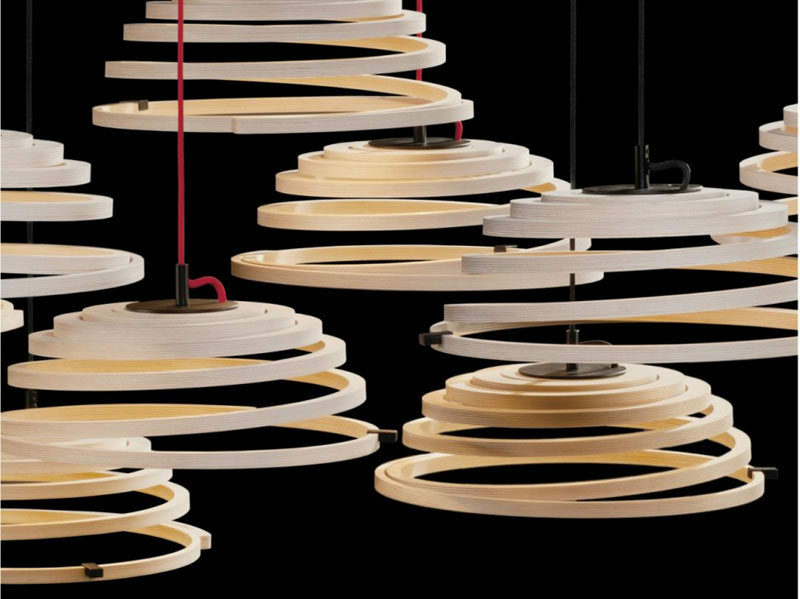 These lights are fashioned from thin strips of cut wood that become a spiral design. See more photos of this light, here. 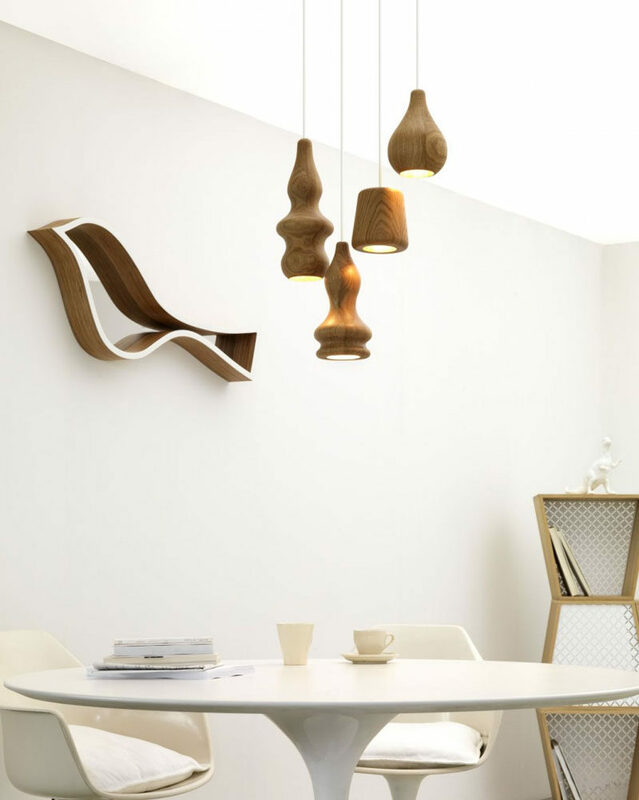 Aspiro Pendant Lamp designed by Seppo Koho for Secto Design. 2. These cracked log pendant lamps make use of the naturally occurring cracks and give the lights a more rustic feel. 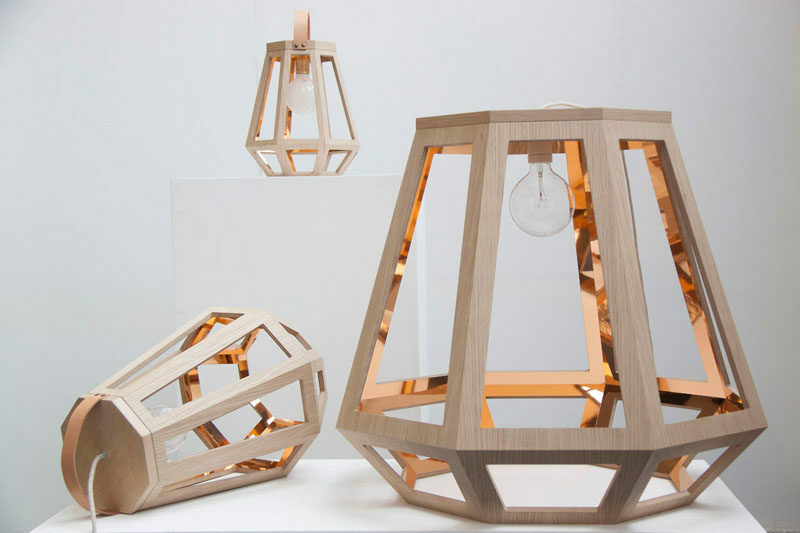 Cracked Log Lamps designed by Duncan Meerding. 3. 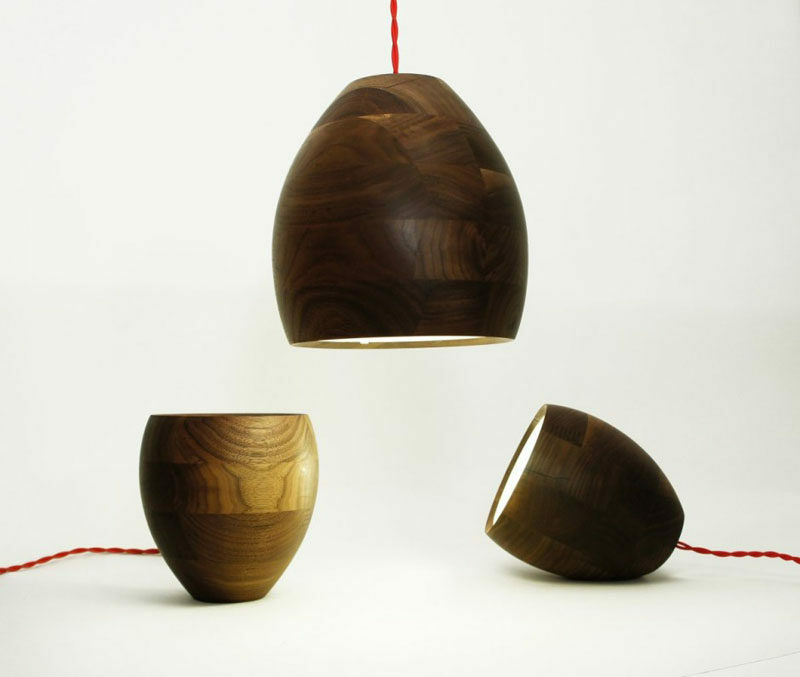 Inspired by flowers, these smooth wood pendant lights are perfect for modern nature lovers. See more photos of this light, here. 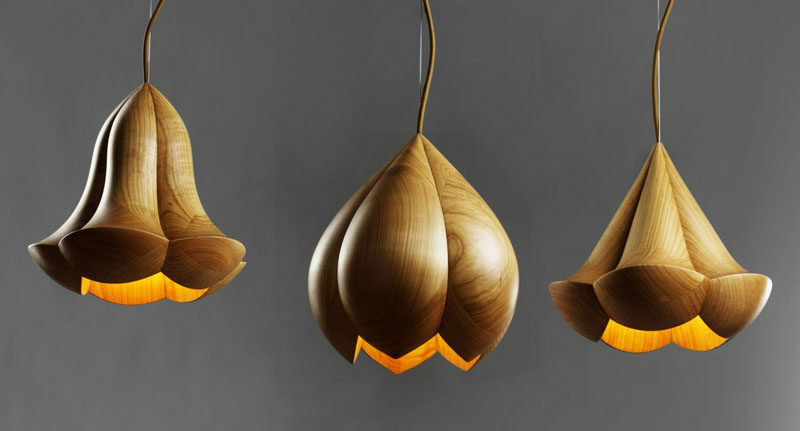 Flower lamp designed by Laszlo Tompa. 4. If you like jellyfish, these wood lights were inspired by them. See more photos of this light, here. The Hydro Lamp designed by Laszlo Tompa. Photography by János Rátki. 5. These oak pendant lights that come in a number of finishes have a hole in the top of them to allow for multiple ways of hanging. See more photos of this light, here. 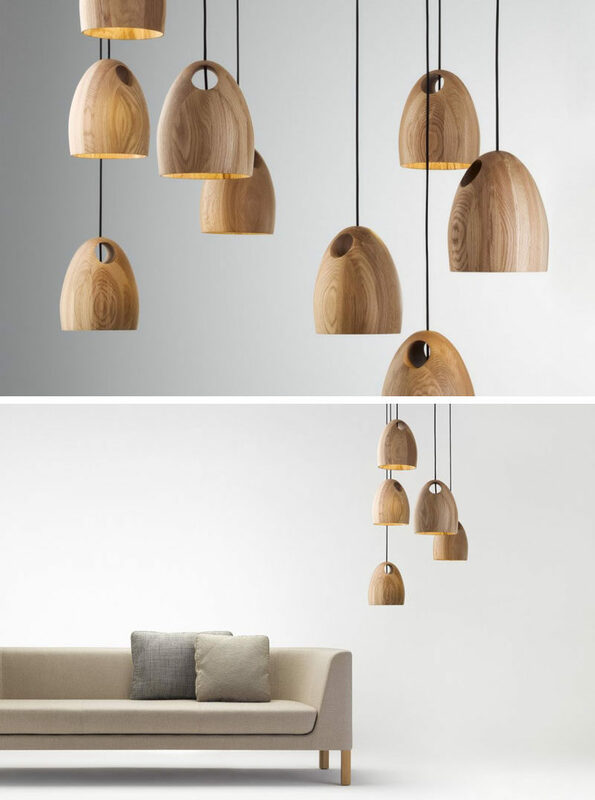 Oak Pendant Lights designed by Ross Gardam. 6. 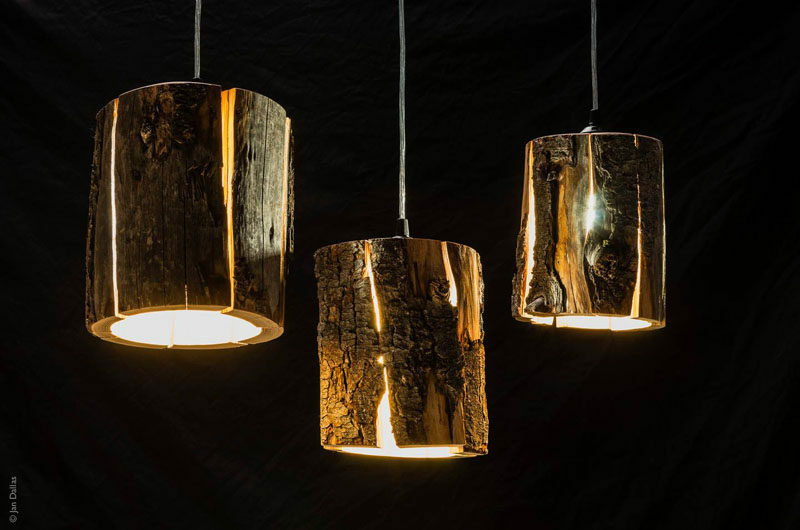 These versatile lamps use wood pieces with inconsistent wood grains to create unique lights that can hang as pendants or sit on their side or bottom, to create different looks depending on where you want them. See more photos of this light, here. Spotty 3 in 1 Lamp designed by Obe & Co.
7. 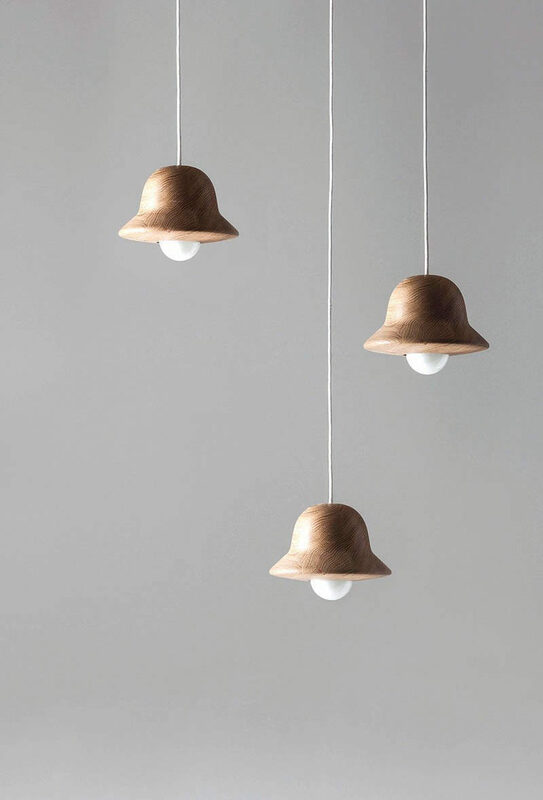 These cute wood pendant lights were modeled after the hat blocks that milliners use to make hats. See more photos of this light, here. The Hat Lamp designed by Norm Architects. Manufactured by Ex.t. 8. 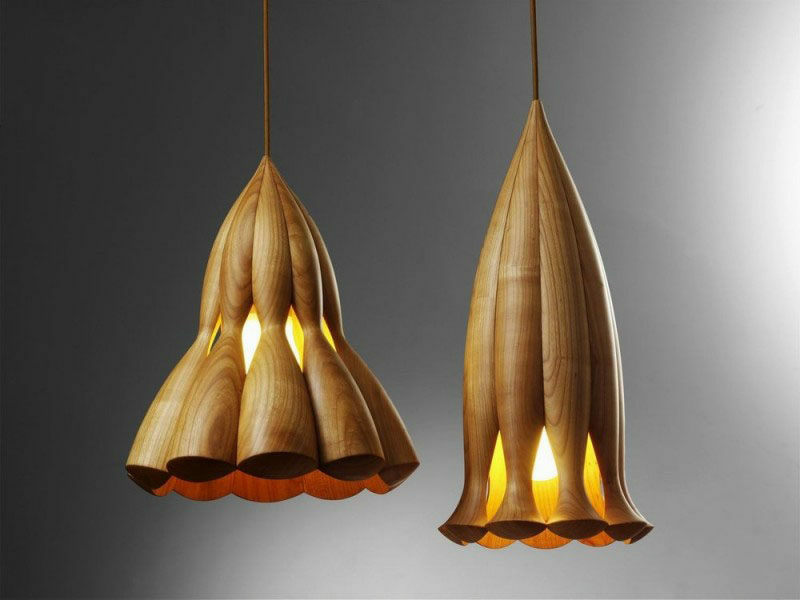 Smooth light colored wood has been used to create these pendant lights in bulbous shapes. See more photos of this light, here. The Blub Lamps designed by Fermetti. Manufactured by Ex.t. 9. 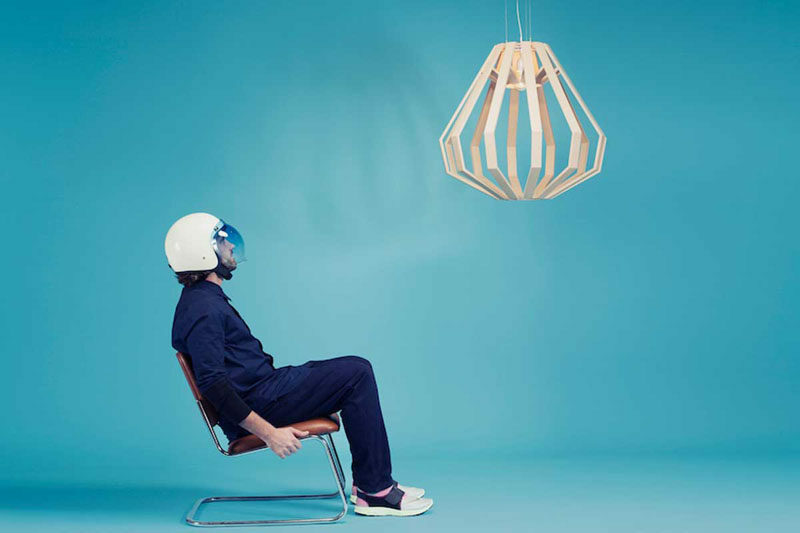 This geometric wood pendant lights were inspired by the Apollo 8 Command Module. See more photos of this light, here. Apollo Lamp designed by Gaël Wuithier of WOODLABO. Photography by © Alfred Cromback. 10. 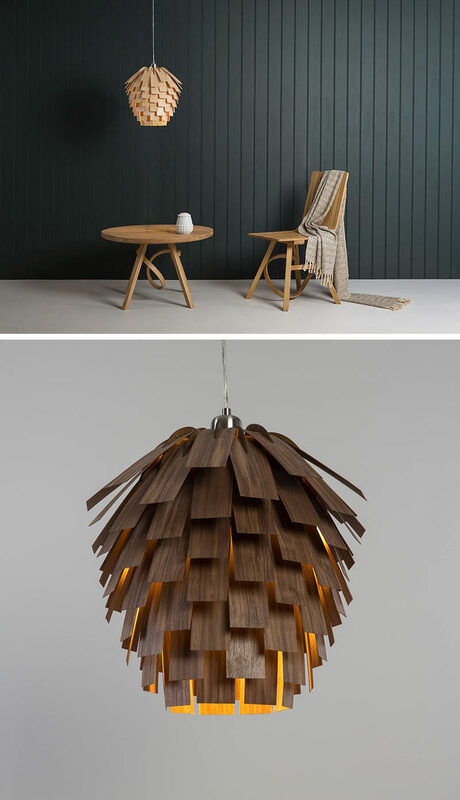 Wood veneer strips are layered on top of each other to create a pendant light that looks like a pine cone. See more photos of this light, here. The Scots Light designed by Tom Raffield. 11. 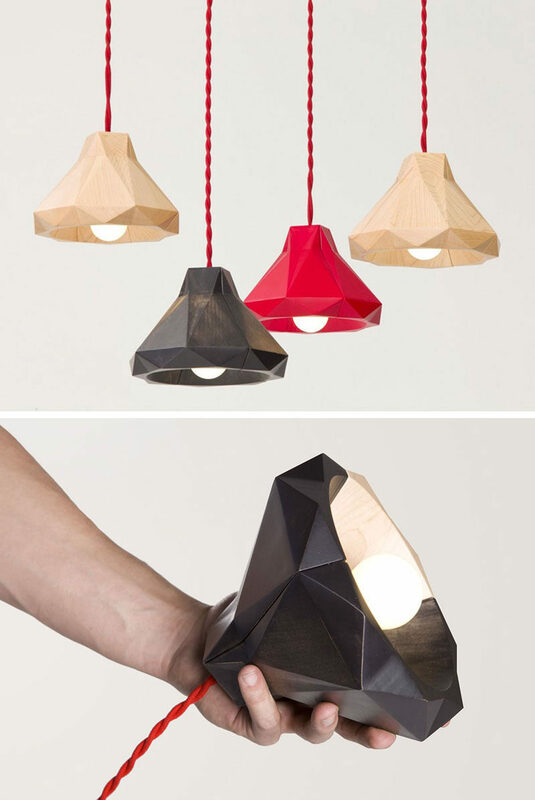 This line of wood pendant lights was inspired by traditional Dutch houses and mining lamps. See more photos of this light, here. ZUID Lamps designed by Françoise Oostwegel. 12. 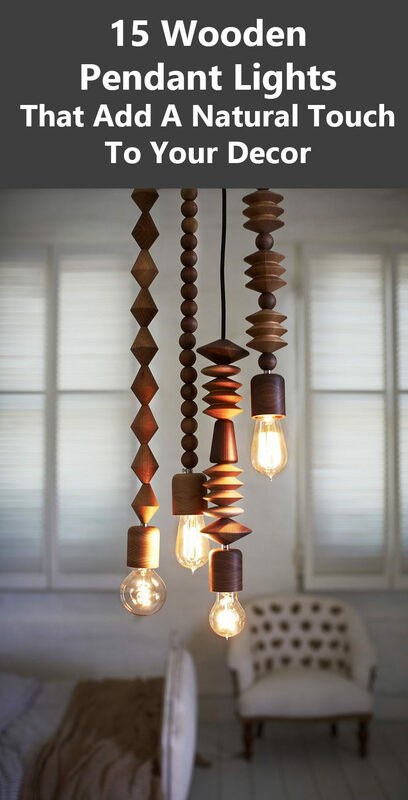 Wood beads in various shapes and sizes make up these pendant lights. See more photos of this light, here. Bright Beads Pendant Lights designed by Marz Designs. Photography by James Braund. 13. 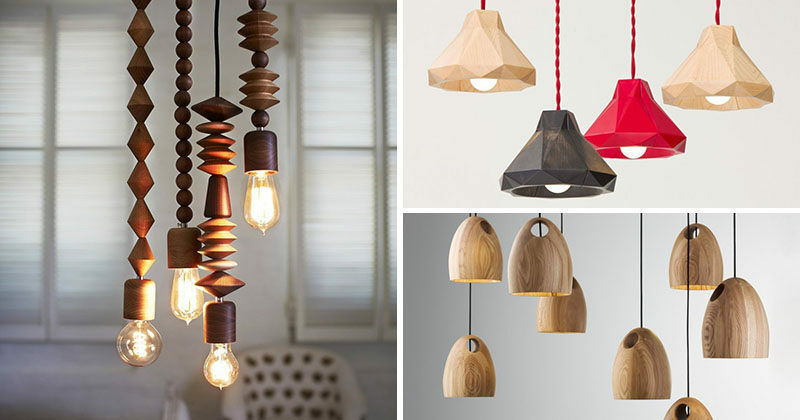 These wood pendant lights have been shaped into geometric designs to add to their modern feel. See more photos of this light, here. The Marionette Lamp designed by Objeti. 14. 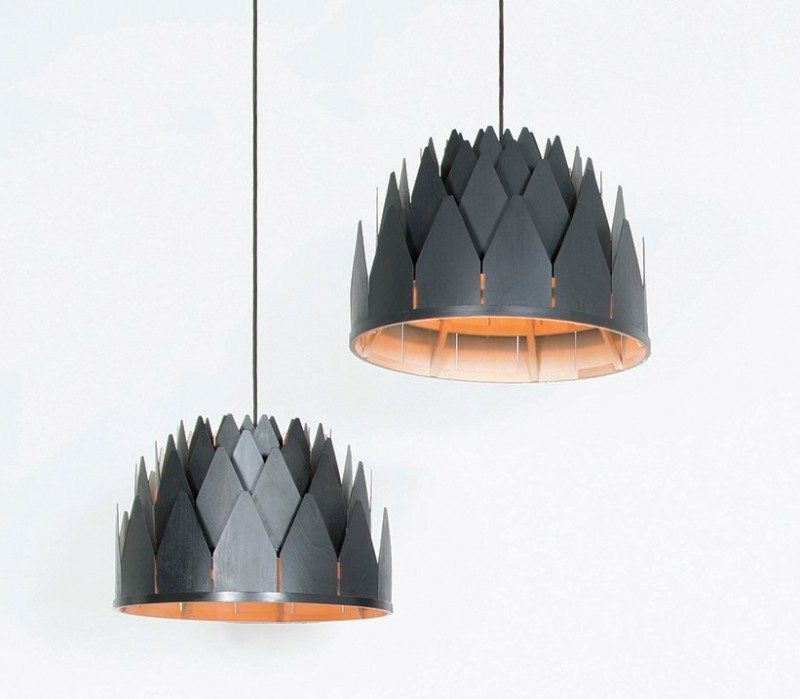 These crown-like wood pendant lights are made from birch that’s been stained black. See more photos of this light, here. Kvelden Lamp designed by Sire Elise Wilhelmsen. Photography by Marie Jacob. 15. 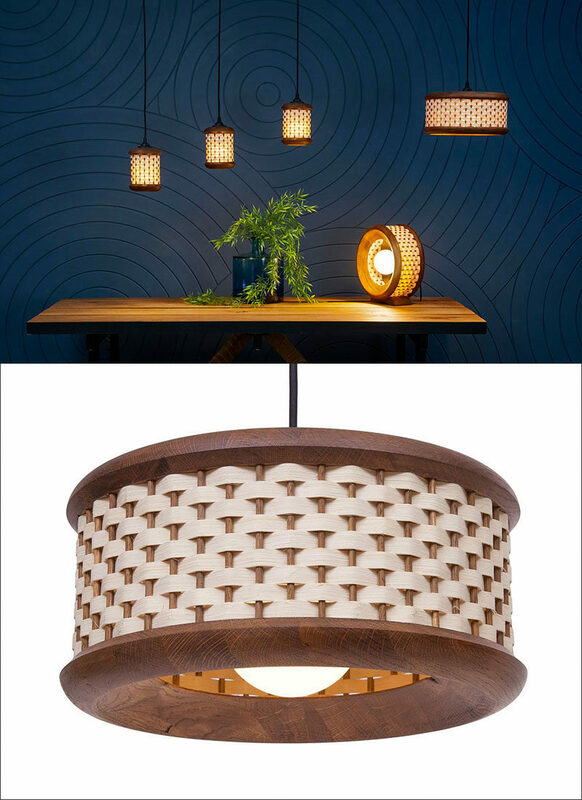 These pendant lights, inspired by traditional basket weaving, cast a warm glow through the hand woven strips of oak. Weave lamp designed by Graham Marjanovic for Obe & Co.